On 21 September, UN Women will host the 2017 Global Business and Philanthropy Leaders’ Forum for Women and Girls and Gender Equality in New York. 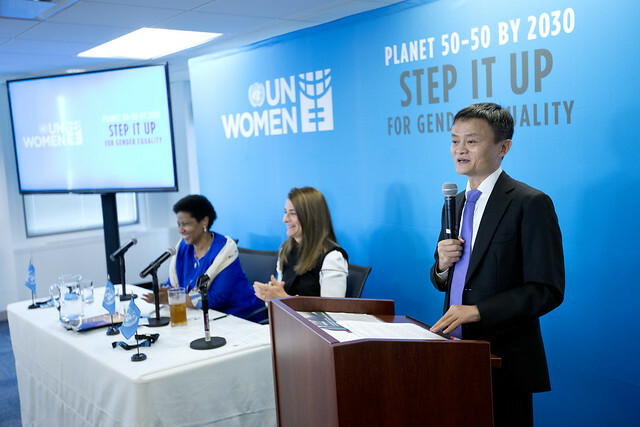 The high-level Forum, taking place on the margins of the United Nations General Assembly, will convene business and philanthropy leaders from around the world who are committed to investing in the empowerment of women and girls. Time: 8 – 9:30 a.m. Investing in women and girls is good for the business and makes for a sustainable future for all. A recent research by McKinsey estimates that if women’s economic participation were to be at the same level as men, $28 trillion could be added to the global economy by 2025.
Business and philanthropy leaders will come together at the Forum to collaborate and announce support towards UN Women’s work and to close the financing gap for gender equality that stands in the way of achieving the Sustainable Development Goals. Emma Watson delivers an inspiring address on International Women's Day at the HeForShe Arts Week launch in March 2016.